Q.) Currently, you and your family live in Charlotte, North Carolina. 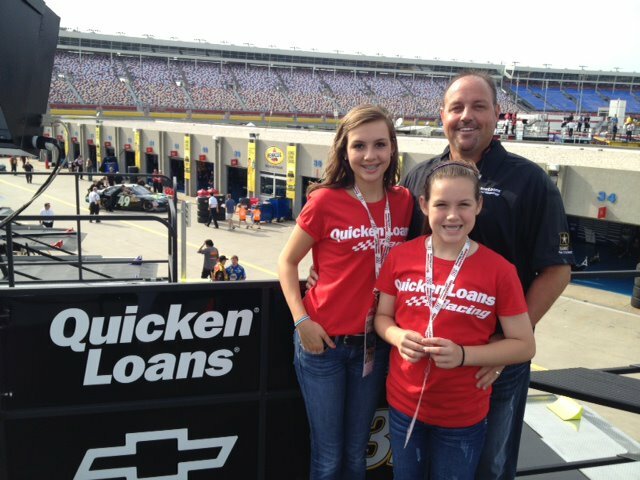 There you work as the Director of Business Development for Quicken Loans Racing. How did you end up in that profession? A.) I have been in the mortgage business for 20 years. Quicken Loans bought our company out. They are big into sports so I took the idea of NASCAR to them and what it could do for branding. Q.) Quicken Loans Racing & their driver, Ryan Newman, race under the Stewart-Haas umbrella. I do not follow NASCAR very closely, but I do follow Danica Patrick (Danica was a member at the gym I manage while racing for Rahal-Letterman) on occasion. Do you ever get to drive Newman's #39 Chevy Impala? A.) I drove the show car, but never the race car. Same car with just a little less horsepower. Q.) My sister, Amy (Class of '91), and her husband are huge NASCAR fans (Their cats name is Smoke). How often do you get to rub elbows with celebrities? In particular, my sister wants to know about your experiences with Ryan Newman and Tony Stewart. A.) Tony and Ryan are great to hang out with. Tony likes to play pool and Ryan likes to fish. Both are very nice and will talk to you anytime. All of the drivers are like that though. NASCAR drivers aren’t like many other pros where you can’t get near them, they are just like us. Q.) Upon graduation you chose Heidelberg College, where you were a 4x letterman and 2-year Captain. A lot of Hilliard football alumni have chosen Heidelberg, but why did you choose to continue your education there? Q.) What is your favorite Hilliard High School football memory? A.) We were playing Mt Vernon and we were down 19-0 in the 2nd quarter before Luke Hanks connected with Tony Moore on a touchdown pass. From there we pounded the ball (I was a lineman) and we won the game 26-19. Also, I will never forget the friends I met and the memories I made. Q.) What opponent did you really get amped up to play against in high school? A.) I loved to play Franklin Heights or Westland... big rivals. Q.) How did Hilliard High School prepare you for where you are today? A.) They taught me to make right choices and be yourself. Coach Barry Blackstone was my role model and friend. We still talk to this day- like my second dad. Q.) What was your favorite Hilliard "hot spot" growing up? Q.) How often do you come back to Hilliard? A.) I come back few times a year. I love to see Hilliard and how it has grown and see friends. Q.) If you could give any advice to the current Hilliard Davidson football team what would it be? A.) Have fun, study hard and prepare yourself to be a man. Make the right choices and do what is right. What you do now will be a direct reflection on who you will become.